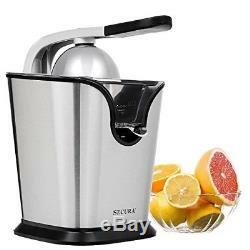 Electric Citrus Juicer Press Fruit stainless Steel Orange Juice Squeezer. If you want to enjoy homegrown orange or grapefruit juice each morning or appreciate the bright flavors that come from adding freshly squeezed lemon and lime juices to your cooking Secura's juice maker gets the job done. 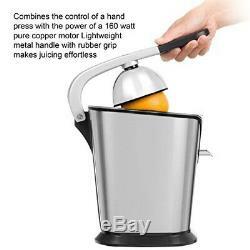 Uniting the traditional hand press design with a motorized reamer takes all the work out of juicing. Whether the recipe calls for a teaspoon of juice or you need OJ for 20 the lightweight metal arm with a rubber grip does the work for you. Plus it puts you in control of the juicing process. You decide when the squeezing is done avoiding the bitterness that can happen with over juicing. Hands and fingers never come near the spinning cone so it is safer for kids and adults alike. Suction cups on the bottom of the base keep it in place. The dual reamer cones work with a variety of citrus fruits. 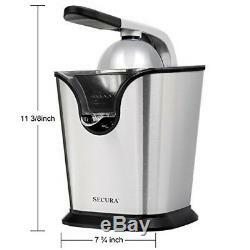 This electrical citrus press has a brushed stainless steel housing with a low-noise pure copper motor. The stainless steel strainer holds the pulp in reserve and filters the juice to its 3-cup reservoir. 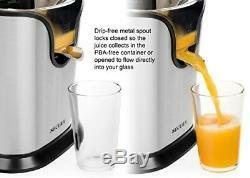 A metal no drip spout can be opened to fill glasses while youre pressing fruit. Drink your juice as is or add some pulp to your glass for additional health benefits. This juice squeezer is fun to use and easy to clean. Secura juicers are built to North American Electrical Standards running 120v, are ETL Certified. 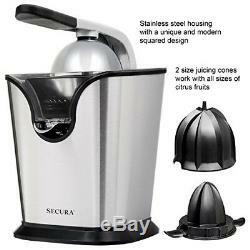 The Secura Electric Citrus Juicer makes a great housewarming or holiday gift. 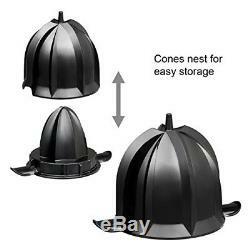 Comes with 2 dual juicer cones the small reamer juices lemons or limes and the larger reamer juices oranges grapefruits or pomegranates and the cones nest for easy storage when done. This Citrus Press combines the control of a manual hand-press juicer with the power of our 160-watt high-performance pure copper motor so you can enjoy fresh squeezed citrus juice for years to come - built to 120 volt North American Electrical Standards and ETL Certified. Precision pro drip-free metal spout locks in place so your homemade juice stays in the machine's easy to clean BPA-free plastic 3-cup container or slide the spout open and fill your favorite juice glass lemonade pitcher or juicing bottles. Enjoy pulp-free fruit juice filtered through the stainless steel strainer or scoop some pulp into your drink and power up your juicing benefits with fiber and additional nutrients. > Our stock all ships from our US-based warehouses. Most orders are in transit for 2 to 5 days but some may take longer. We do our best to process as quickly as possible. Our electronic products are manufactured according to the specifications of the US Electrical Standards and Codes. We assume no responsibility if the items malfunction or cause an accident because one tried to use the product with foreign electrical standards. The use of a converter or other voltage transforming device is at your own risk. Thank you for shopping with us! The item "Electric Citrus Juicer Press Fruit stainless Steel Orange Juice Squeezer" is in sale since Sunday, October 7, 2018. This item is in the category "Home & Garden\Kitchen, Dining & Bar\Small Kitchen Appliances\Juicers". The seller is "directtoyourdoor" and is located in multiple locations. This item can be shipped to United States, Canada, Australia, Japan, China, South Korea, Indonesia, Taiwan, South africa, Thailand, Hong Kong, Bahamas, Israel, Mexico, New Zealand, Philippines, Singapore, Saudi arabia, United arab emirates, Qatar, Kuwait, Bahrain, Malaysia, Brazil, Chile, Colombia, Costa rica, Dominican republic, Panama, Trinidad and tobago, Guatemala, El salvador, Honduras, Jamaica, Viet nam, Uruguay.